This heirloom-variety buttermilk starter creates a traditional cultured buttermilk that is rich in nutrients. 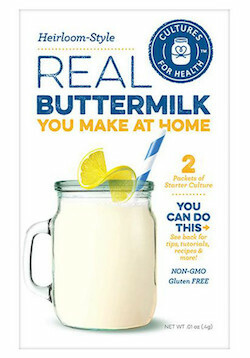 Homemade buttermilk can be used for baking, drinking or can be added to cream for making cultured butter and is delicious in a variety of recipes. Manufactured in a facility that also produces products containing gluten and dairy. Non-GMO. Culture may be used to make raw milk buttermilk. Cultures on the counter top at 70-77ºF. Add 1 packet of starter culture and mix well. Cover the container with a towel or coffee filter secured with a rubber band or put a lid on the container and culture in a warm spot, 70-77 ºF. Check after 24 hours to see if your buttermilk has set. If it has not set, leave up to 48 hours, checking every few hours. Once it has set or at the end of 48 hours, cover with a tight lid and refrigerate for at least 6 hours. After 6 hours you can eat your cultured buttermilk but don't forget to reserve 1/4 cup for culturing the next batch. Each box contains 2 packets of starter culture.